Citizens for a Wilder West was founded by President-for-Life Lore Orion in 1994. It is a un-organization with 10's of thousands, if not 100's of thousands, of members, most of whom have never even heard of it. Citizens for a Wilder West has no meetings, no dues, and no bi-laws, although it does have quite a few outlaws. Citizens for a Wilder West is not a political entity with an agenda, nor is it an environmental organization. It is too hard to hug a cactus. Citizens for a Wilder West know who they are. If you have to ask what a Citizen for a Wilder West is- you're not. Lore Orion is a cowboy who is also an artist, songwriter, and author with successes in all three fields. As an artist he has done album covers for The New Riders of the Purple Sage, "Panama Red" being his best known, Lonnie Mack, Billy Joe Shaver and others. Among the many recording artists Lore has done artwork for are The Grateful Dead, Jefferson Airplane, Waylon Jennings, and Johnny Rodriguez. Lore has written and illustrated three children's books which were published by McGraw-Hill under the pseudoname Lore Shoberg. He has drawn gags and written horror stories for DC Comics' House of Mystery series. Lore's spot gags have also appeared in The National Lampoon. He has written 22 one act western comedies and one 3 act western musical called 'Saloon'. He is currently working on a country music parody of 'The Phantom of the Opera' called 'The Phantom of the Opry'. 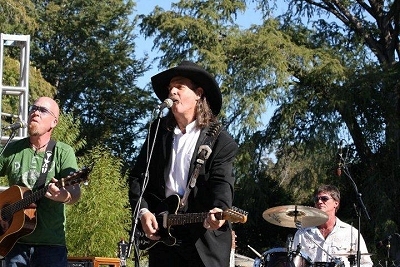 Lore's songs have been recorded by Bill Anderson, David Rogers, Waylon Jennings, and, most recently, two of Lore's songs were included on Tim McGraw's 'Tim McGraw and the Dancehall Doctors' album. Lore has also had the indescribable honor of having two world champion cowboys, Chris LeDoux and Larry Mahan, record his songs. As a recording artist, Lore got his start singing on National Geographic records, back when they had a label. MCA records signed Lore's band 'Bandera' in the late 70's. When the record flopped due to lack of divine interest, Lore moved back to Bandera, Texas. He met a cowgirl there, fell in love, and wrangled horses. Based out of the Mayan Ranch, he continued his recording and performing career by releasing albums and touring England with his band The Legends. Lore has stopped touring now and devotes his time to writing songs and plays, drawing pictures, working with a Nashville based concept band called KATTL, and helping to raise his two adopted angels- son Cowboy Kidd, 12 and daughter Rio, 11. Click for info on and samples of "Beach Bums and Saddle Tramps"